This was a combination "Green Expo" and NDEW Event. The number of EVs registered (29) in a short amount of time was overwhelming, and the large number of visitors (along with great weather, live music and give-a-ways) made for a fantastic "2nd Year" Annual Event for the City of Hyattsville. 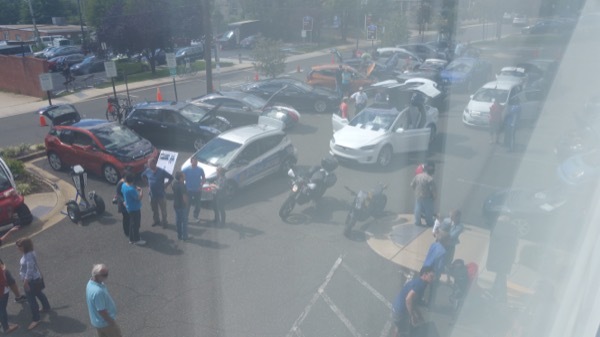 Some of the unique vehicles on display were a 2017 Chevrolet Bolt as a marked Hyattsville Police Vehicle (we think it's the first one in the country) and a marked Zero DSP Police Motorcycle. Both of these vehicles had all of their emergency lights on, which helped draw attention to the EV part of the event. We also had a (no longer available) 2014 Brammo Electric Motorcycle, which had a crowd around it the entire time, and a Tesla Model "X," which is always an attention-getter. We were very fortunate to have a nice variety of EV makes and models, and the response from the visitors was extremely positive. We were so happy with the turnout, that we are already planning next year's event! The City of Hyattsville will be hosting its 2nd Annual "Green Expo" in the parking lot of the City Municipal Center, which will include the second "National Drive Electric Week" event at this location. This year's event will feature an all-electric, fully marked Chevrolet Bolt Police Cruiser, an all-electric Zero DSP Police Motorcycle, and several personally owned electric vehicles of different makes and models. If you are interested in "all things green," then this is the place to be! Come out and join us for this truly unique event! Click the blue register button at the top of this page, and you'll be entered to win a chance at a $250 gift card. Registered attendees report 688,022 electric miles driven.